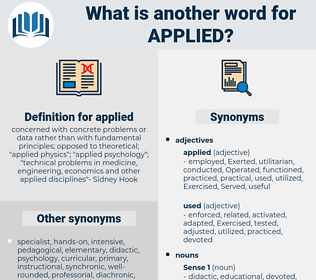 What is another word for applied? Followed, pursued, applications, available, utilised, diligent, respected. applicants, Recommendations, procedures, claims, Charges, functions, enquiries, Inquiries, controls, matters, applications. appropriated, played, Appealed, appeals, Participated, Took, laid, paid, Prevailed, Appeared, Relied, demonstrated, Approached, Existed, Petitioned, related, appointed, Stipulated, Deployed, Criteria, generalized, Postulated, correspond, Corresponded, regulating, placed, Introduced, Displayed, Obtained, Obtaining, Submitted, approved, Attributed, adopted, Caught, encouraged, accepted, relationship, Enabled, permission, initiated, allocated, planted, included, guaranteed, Asked, Testified, Filed, register, Invoked, Indicated, permitted, Undertook, Helped, presented, contained, described, represented, Reiterated, Levied, led, Withdrew, FORMATS, fulfilled, Allowed, Contributed, transposed, examination, governed, engaged, left, enlisted, Disappeared, reported, Forwarded, granted, recourse, Exercised, extended, taxation, Carried, propose, completed, developed, Enjoyed, Delivered, Demanded, increased, suggested, Upheld, impacted, Claimed, identified, withheld, requisitioned, Achieved, actuated, failed, triggered, Proceeded, GONNA, considered, supported, expressed, Taxed, received, Performed, Instituted, discharge, said, Inserted, contacted, authority, learned, landed, held, affected, recommended, inscribed, selected, gathered, commissioned, sustained, effected, planned, Volunteered, covered, Attracted, allotted, Occurred, Captured, Enacted, anticipated, okay, travelled, conducted, Resulted, opted, labored, pointed, executed, Passed, deducted, Questioned, concept, welcomed, called, Seconded, advised, spoke, Competed, invited, Detained, Lasted, Refused, case, cases, Created, Lobbied, mandated, Promoted, area, Deposited, concluded, directed, started, drew, elected, Resorted, Envisaged, Wore, transmitted, Benefited, benefits, courses, Lodged, Launched, maintained, opened, estimated, produced, unleashed, Challenged, Aimed, listed, attached, Targeted, determined, sought, endorsed, Arrived, seizure, Classes, Insisted, turned, arranged, claims, sat, Urged, predicted, attempted, Enshrined, recorded, Wrote, concerned, concerning, Happened, Grabbed, advanced, Succeeded, Reached, Entered, Was, Were, retained, connected, outlined, Earmarked, affixed, Came, honoured, charged, Queried, hired, Wished, attended, Began, Chose, fine, Arose, Examined, seized, Cautioned, scheduled, raised, Brought, forced, found, Assessed, tabled, tracked, Ranged, Wondered, gripped, monitor, monitoring, monitored, Told, dropped, expected, Awarded, shared, Became, continued, pulled, Inquired, forecast, Invoiced, Exported, Debated, HIT, Worked, Ensued, Dealt, Tasked, va, consumed, enquired, Had, Offered, Warned, moved, Cited, posted, briefed, Discussed, agreed, Chaired, posed, showed, wanted, read, Quoted, noted, shot, intended, won, Caused, sent, faced, action, focussed, projected, designed, misused, eyes, Gave, Served, bet, ok, headed, fired, Hoped, motion, secure, secured, formed, kept, decided, Remained, ordered, orders, saw, stated, fixed, signed, thought, go, Went, courts, Ran, Acted, look, Looked, cut, 'il, Got, dated, Did, 'd, made, Followed, pursued, applications, utilised, obtain, respected. prevailing, pursuing, representing, operating, executing, functioning. Complied, appropriated, played, operationalized, Appealed, incorporated, spread, principle, Participated, multiplied, laid, Replied, paid, implementable, Prevailed, Relied, illustrated, demonstrated, Approached, Existed, Standards, Petitioned, come, related, appointed, principles, concentrated, Explained, classified, Replicated, Supplied, Deployed, Criteria, generalized, regulated, Postulated, integrated, placed, Introduced, become, Displayed, Obtained, internalized, Submitted, acknowledged, approved, Attributed, adopted, unimplemented, extrapolated, evaluated, Caught, accompanied, Appended, encouraged, tapped, accepted, labeled, prescribed, Embraced, additional, Enabled, designated, declared, initiated, handed, allocated, restricted, realized, leveraged, experienced, understood, planted, adapted, Manipulated, accomplished, included, guaranteed, generalised, Asked, Filed, Extradited, Invoked, Indicated, permitted, Helped, presented, ventilated, protocol, contained, sprayed, repeated, abided, described, Transferred, represented, subscribed, Prosecuted, Translated, Perpetrated, realised, delayed, Levied, discontinued, perceived, led, fulfilled, Allowed, imagined, calculated, Regarded, transposed, alleged, governed, Explored, Channelled, engaged, calledfor, left, suspended, processed, install, diploma, authorized, interpreted, satisfied, expanded, published, reinstalled, operable, valued, reported, Responded, located, recognised, Forwarded, granted, standard, reproduced, measured, recourse, Exercised, extended, pulverized, Carried, reflected, phased, acquired, completed, developed, envisioned, recognized, Enjoyed, Delivered, solicited, collected, Borne, entitled, corrected, Subjected, Imparted, Availed, assigned, elicited, Demanded, formulated, increased, suggested, distributed, stamped, Upheld, impacted, Obeyed, organised, replaced, Claimed, convention, transformed, identified, specified, exploited, withheld, loaded, tailored, derived, Achieved, assembled, actuated, triggered, altered, activated, embodied, structured, Advocated, considered, Inoculated, discharged, supported, detailed, expressed, Taxed, removed, accredited, received, Performed, sampled, search, Instituted, indicators, Influenced, said, Mobilized, Inserted, Opportunities, contacted, authorised, learned, landed, held, advertised, affected, recommended, dictated, inscribed, selected, commissioned, sustained, effected, planned, covered, Attracted, allotted, pressed, Captured, blamed, Enacted, Exerted, anticipated, scaled, Managed, conducted, updated, Resulted, fallen, opted, instructed, taught, spoken, Referred, pointed, interviewed, executed, supposed, Passed, deducted, Mentioned, Questioned, obliged, assumed, called, handled, aerated, Seconded, adjusted, Constructed, advised, pronounced, invited, Detained, resort, cases, Created, worn, mandated, Promoted, subtracted, Stationed, Deposited, concluded, directed, started, Waged, elected, Resorted, Computed, transmitted, Mapped, Benefited, Lodged, Launched, Afforded, maintained, converted, estimated, Consulted, Construed, reduced, produced, Challenged, Aimed, listed, attached, condemned, filled, Emerged, accused, Targeted, determined, verified, devoted, postponed, rule, ruled, sought, justified, Encountered, endorsed, Notified, imported, modified, Evolved, Insisted, Denied, earned, turned, written, arranged, rolled, treated, Borrowed, Urged, Been, exhausted, positioned, arrested, predicted, Levelled, Spilled, Pushed, attempted, Enshrined, Suffered, added, recorded, concerned, Undergone, contracted, Happened, mobilised, reinforced, defined, Inflicted, informed, Convened, advanced, Succeeded, Reached, heated, Argued, Entered, embedded, resolution, grouped, Incurred, Answered, Ascribed, absorbed, retained, connected, outlined, punished, Earmarked, Arisen, affixed, lost, honoured, protected, charged, Prompted, artwork, Queried, printed, hired, amended, Meted, attended, exposed, harnessed, chosen, credited, guided, Examined, seized, Inferred, Lived, linked, scheduled, controlled, raised, noticed, suited, Brought, Deduced, invested, expended, bound, geared, forced, found, Assessed, tabled, checked, deferred, Canvassed, tracked, taken, Resumed, reserved, Enjoined, Annexed, fit, Fitted, settled, minors, monitored, Fought, Told, foreseen, Tendered, model, dropped, expected, Awarded, have, reviewed, nitrogen, Deemed, shared, continued, Sentenced, Gained, fed, Invoiced, revised, Exported, changed, furnished, ensured, divided, HIT, Worked, Dealt, Tasked, consumed, Screened, entrusted, enquired, tried, budgeted, billed, Had, owed, Offered, let, Warned, moved, tested, Shown, closed, Cited, posted, ranked, Discussed, agreed, desired, dashed, Chaired, heard, posed, cost, wanted, read, Quoted, noted, insured, intended, decreed, won, Caused, inclined, Accounted, sent, faced, actioned, vested, sunk, booked, action, focussed, founded, projected, designed, Meant, ec, deposed, routed, convicted, bulletin, Viewed, destined, given, rectified, Returned, trusted, sold, Shifted, Served, powered, known, headed, Visited, fired, driven, voiced, secured, built, vented, marked, kept, decided, Voted, seen, based, Remained, ordered, assured, Accorded, mounted, stated, 159, fixed, gone, signed, thought, Acted, Commanded, 32, Looked, Got, dated, done, made, Followed, pursued, applications, utilised, respected. Complied, adhere, Pertained, enrolled, instructed, Referred, applicable. unattainable, unavailable, inapplicable, unobtainable, nonpractical, pure, armchair, unworkable, unreachable, inaccessible, impracticable, unsuitable, impractical, useless, unusable. To those that applied and paid their five dollars, all was right with the Doctor; while those who considered his title to the land not good, and that therefore he had no right to direct who should build and who should not, had their lots sold to others. She applied herself eagerly to the task. appalled, ablated, ablaut, abvolt, applaud, afloat, appellate, aplite, applet, ability, ablate, applewood, affability, affiliate, afield, affiliated.